Pallacanestro Olimpia EA7 Emporio Armani Milanoagreed on a two-year deal with Serbian center Milan Macvan, 26, 2.06 mt, coming from Partizan Belgrade. 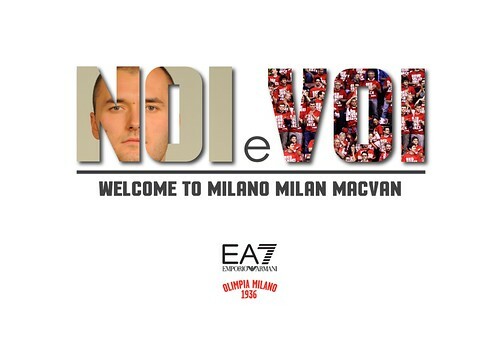 WHO’S MACVAN – Born on November 16, 1989 in Vukovar, Milan Macvan grew up in FMP Zeleznik youth system. In 2007 he signed his first pro contract with Hemofram Vrsacand remained there until 2010 where he moved to Maccabi Tel Aviv reaching the Madrid’s Final Four where his team lost the final against Panathinaikos. After one year he moved to Partizan Belgrade for the 2011/12 season (15.3 points per game, 8.0 rebounds per game in Euroleague competition) and then to Galatasaray Istanbul for two more seasons (he averaged 6.8 points per game and 4.5 rebounds in 2013/14 Euroleague). At the beginning of last season, he came back to Partizan where he played in the Eurocup averaging 18.0 points and 8.7 rebounds per game. NOTES – In 2011he won the Israelian title with Maccabi, in 2012 he won the Serbian championship with Partizan and in 2013 the Turkish title with Galatasaray… He was named “Eurocup Rising Star” in 2009 (11.3 points per game and 4.2 rebounds playing for Hemofarm)… He won the World Under 19 Championship in 2007, the European Under 20 Championship in 2008 and the World University Games in 2o09… He won the silver medal at the European championship in 2009… He run a personal website: macvanmilan.com… In 2011 he was drafted with number 54 by the NBA’s Cleveland Cavaliers… In 2009 he was the Hoop Summit’s Mvp in Portland by scoring 23 points and grabbing 14 rebounds for the World Team.